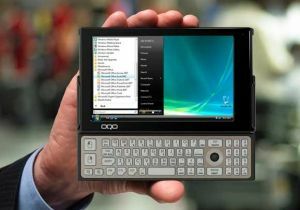 There are reports that the new OQO Model 02+ UMPC OLED display is not as efficient as you'd expect. The PC is not available yet, but there are some pre-production models around, and someone tried to see how much power the display takes. As far as I understand, they tested the power-consumption of the entire PC - and it's not so good - but it may be the fault of other components and not just the display. OLED (PMOLED) maybe not very saving electric energy, but AMOLED beter saving than OLED if I good understand about what you write. Yes, but the OQO has an AMOLED display, not a PMOLED.